A man has been shot in his shoulder in a 'targeted attack' in Leeds. 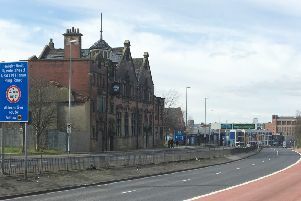 A police cordon is in place at the scene of last night's shooting, in Burmantofts Street, and has been causing major delays to commuters this morning. 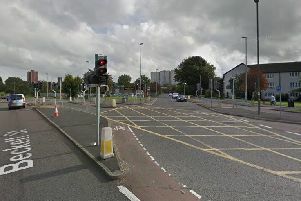 The shooting happened at about 6.30pm when the 23-year-old victim was in a BMW car waiting at traffic lights in Burmantofts Street, near to the A64 flyover. A silver Mazda 3 forced its way through the traffic and pulled alongside the BMW. Three black men wearing balaclavas got out of the Mazda. Two were armed with machetes or bats and began attacking the vehicle before one of the three produced what was believed to be a handgun and fired at the victim, who was sat in the front passenger seat. The men left the scene in the Mazda, reversing into a car behind it, causing damage, before making off down St Mary’s Street. The victim was driven to nearby St James’s Hospital with a gunshot wound to his shoulder. The injury was described as minor and he was treated and released. He has since been arrested on suspicion of possession of a firearm with intent to cause fear of violence and is currently in custody. The silver Mazda 3 was later found burned out in Davies Avenue, Roundhay. The large police cordon is currently in place in Burmantofts Street, near Beckett Street and Nippet Lane, while officers carry out searches and forensic examination. Detective Inspector Andy Farrell, of West Yorkshire Police Firearms Prevent Team, said: “We believe this has been a targeted attack on the victim. The criminal use of firearms on the streets is always something that we treat very seriously and we are currently carrying out extensive enquiries to identify those responsible and to establish the full circumstances surrounding this incident. “We recognise the scene we have in place on a main commuter route will be causing significant disruption to the public and to the hospital site but we are doing everything we can to minimise that and to process the scene as quickly as possible while ensuring we gather all necessary evidence. “We have already spoken to a number of witnesses but we would still like to hear from anyone who witnessed the incident or who has any information that could assist the investigation. “We are particularly keen to hear from anyone who saw anyone acting suspiciously in Davies Avenue, Roundhay, where the silver Mazda 3 was abandoned and set on fire. Anyone with any information is asked to contact the Firearms Prevent Team via 101 quoting Operation Flowwick or Crimestoppers, anonymously, on 0800 555 111. West Yorkshire Metro has warned of delays on the roads, with buses having to take diversions. A spokesman said bus routes 4, 16, 49, 50 and 50A were all affected, with "delays likely". Buses towards Leeds are being diverted via Lincoln Green Road, Skinner Lane, Regent Street and Eastgate. Buses heading out of Leeds are being diverted via Regents Street, Skinner Lane and Lincoln Green Road.